I was really satisfied with this trip because it was such a fruitful one. It is an awesome shopping place for girls but for guys it's torture. but I only came across a handful of stores selling male clothing. bringing them shopping in Bangkok will most likely do the trick. There are 2 parts to this market. but it really only opens from 5am-9am. Therefore, you really have to wake up early to visit this market. This is THE best market place for shopping yet! They mainly sell fashionable clothes that is currently in season. So, it is just perfect! from the same stall to get a cheaper price. is usually more than 100 baht extra. Another landmark to help locate the market is Indra Square. The morning market is just behind the shopping center. Don't be surprise if you see people dragging luggage like bags on wheels. This is just to ease shoppers from having to carry their heavy hauls. Just imagine the intense amount of goods people buy there! so to save me the extra effort of carrying the massive amounts of bags. No trolley bags for us. I do recommend getting one but if not don't need to waste your money ya. Because, I find it already difficult to walk the cramped up walk way of the market, imagine pulling a huge luggage with you! because we got so many plastic bags on the 1st day and we felt pain for the environment. to be used as our shopping bags. And we actually brought those plastic bags back home to be re-used as trash bags. The second part of the market opens roughly about 8am till about 5pm. This market here is just a few steps away from the morning market mentioned earlier. at this market at a cheaper price. At least 100 baht cheaper. so you really have to walk down and explore. This is another good landmark if you are finding it difficult to find the place. there is another gigantic section on the other side. One day is really not enough to explore all the shops. Believe me, we always found something different to buy. And, we bought A LOT in this market. Definitely must visit market when you are in Bangkok. 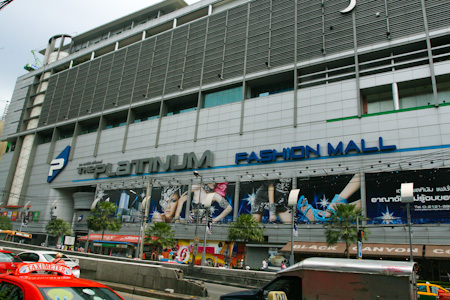 Every shopping who comes to Bangkok knows about Platinum Fashion Mall. If you have not visited it yet. It is one of the highlights for any shopaholic. This mall reminds me a lot of Sungai Wang in KL. just that it has air-con. There are also rows and rows of shops. The 1st wing sells mostly clothing and accessories. which is again at least 3 pieces and above. The 2nd wing sells clothing, shoes and bags. Here is one of the tops I bought from Platinum. I just could not resist the puffy sleeves. My sis say this top is so me. compared to the Pratunam market place. selling more expensive in Platinum mall. So, it is still worth it in the end. between the trees and the building under construction. One of the entrance into the market place. Here are some pictures of the outdoor walk way. that leads to many many many shops. but do expect the stores to close about 5pm. One day is really not enough. There are a total of 27 sections of shops in this market. as this makes shopping easier. Getting lost in the market is a possibility. otherwise, you may not enjoy the experience as much. we did managed to buy some lovely tops and shades for only RM4.90! How to get to Chatuchak? the market is less than 5 minutes walk away. where it stops right in the middle of the market. because it is the most creative stalls I came across in Bangkok. This mall is kind of diagonally opposite of Platinum mall. and you will be able to see Palladium Mall. and it will stay open till 12am. They have a few DIY goods sold there that are absolutely irresistible. personalize the notebook or covers by putting your name there. I just had to get one for myself la. Thankfully the book allows me to remove/add pages. passport covers, bags and so on. The lady busy personalizing the item. Look at the color choices of pouches they have. How could we not get one for ourselves right? So, we got personalized passport covers for our whole family. plus they actually have little ornaments that you can add on. We chose the male/female ones. Another 20 baht for each of the ornaments. Total is 120 baht, RM12 for a personalized cover! There is also a stall where they personalize T-shirts. This shop here is interesting. or they can actually print designs of your choice onto the rattan bag. See that pile of paper like things in plastic on the right??? Those are the various designs available for you to be printed on the bag. but you can see rose design printed on the bag. That is one of the prints available. The prices for the bag varies according to size. and an additional 50 baht for the printing. but my sister stopped me! She says I will probably used it once and abandon it. Oh well, she knows me best. But I still can shake the feeling of regret! Bangkok, I am coming back! My sis and I each got a pair. A very friendly stall owner. He was very patience with us when we were deciding which color strap to choose. The slippers cost 199 baht each. But we got it at 190 baht instead. As we were the last few customers, the stall owner gave us a small discount. We were there till about 12am! I really enjoyed my time at this market because it is spacious and cooling. Big C is one of their chain supermarket. It is something like how Giant/Aeon is like here in Malaysia. There were so many tourist buying their goods like crazy! It kinda made us buy more than we intended to. Some of the food we bought. All our friends requested to buy their instant noodles. if preparing for the end of the world! Some even bought it by the cartons! as it is cheaper compared and there are more choices. Besides that, in Big C, there is a Levi's store that was having a clearance sale. Levi's 501 jeans for the guys were going for only 1000 baht! That is approximately RM100 ONLY! The female jeans were going for RM89 only! They were selling the curve ID jeans too for the same price! usually i wear a Bold but Demi is ok too. Siam Paragon from Platinum Mall. The moment you exit at BTS Siam station, you will be able to see many stalls on the opposite side of Siam Paragon. which are pretty similar to the morning market at Pratunam. However, they do sell the clothes slightly more expensive than the morning market. you will also walk pass the Siam Square area. There are also many shops there to explore too. open from Tuesday-Sunday, starting from about 7pm-10pm. you do not have anything else planned. There are plenty of high-end shopping malls around the Siam area. There are plenty of shops in MBK. even the things that they sell is somewhat similar. I did came across these Gaga looking shoes. Look at the original price. Guess how much i got them for??? I love it when I come across such good deals! So I bought 2 pairs. many shoes or bags for sales around those market areas. Platinum were just too expensive. So, feeling a little disappointed, we wondered around the shopping malls. And we entered Forever21 in Central World mall. Those booties are my sisters, don't they just look fab with the sparkly heel. it was a fruitful shopping vacation. like how you see people do on their hotel beds. We just didn't have the patience to roll them up one by one. and we came back with 43kgs of goods. Before I end, here is G-Dragon latest single, Crooked. We came across it when in Bangkok. Must watch if you haven't! Did you like this post?? ?